In addition to the WHL Scholarship players receive upon graduation from the WHL, all current WHL players are encouraged to enroll in post-secondary courses and these courses are also fully-funded by the WHL member Clubs. This season, over 175 current players are taking post-secondary courses while playing in the WHL. The financial assistance received for post-secondary studies while playing does not impact on the WHL Scholarship benefits a WHL player is entitled to upon graduating from the League. The WHL and Athabasca University have partnered to offer, through an online distance education platform, fully-accredited university courses to any WHL player interested in further pursuing post-secondary studies while playing in the WHL. This year, over 75 current WHL players have taken courses through Athabasca University. This year, 249 of the 405 WHL Scholarship recipients are furthering their education at Universities in Western Canada, with 140 of those playing Canadian University hockey at the U SPORTS level in Canada West (CW) hockey league. In many cases, these student-athletes have combined their WHL Scholarship with additional financial assistance from Canada West Universities to receive the Western Canada Premier Hockey Scholarship. Among the 199 WHL graduates playing Canadian University hockey at the U SPORTS level are 83 WHL Alumni, including 66 from Canada West, set to compete at the 2019 Cavendish Farms University Cup in Lethbridge, Alta., from March 14 to 17. The University of Saskatchewan (Saskatoon, Sask.) leads all post-secondary institutions with 38 WHL graduates enrolled in full-time studies, while 34 former WHL players are registered at the University of Alberta (Edmonton, Alta.). The University of British Columbia (28), University of Calgary (24), University of Lethbridge (23), University of Regina (23), Mount Royal University (23) and University of Manitoba (21) also lead the way in WHL graduate enrolment. WHL Scholarship recipients are enrolled this year as full-time students at 77 different post-secondary institutions throughout North America. Alberta leads all western provinces, having produced 162 WHL graduates currently accessing their WHL Scholarship, followed by British Columbia (90), Saskatchewan (80) and Manitoba (41). A total of 29 U.S. players are accessing their WHL Scholarship. Among the 2018-19 WHL Scholarship recipients, 156 WHL graduates are enrolled at universities in Eastern Canada, Canadian colleges, trades or technical institutions, or attending post-secondary in the United States. The number of WHL Scholarships awarded during the 2018-19 academic season has continued to trend upwards over the past 10 years. During the academic season for 2009-10, a total of 274 WHL Scholarships were awarded. 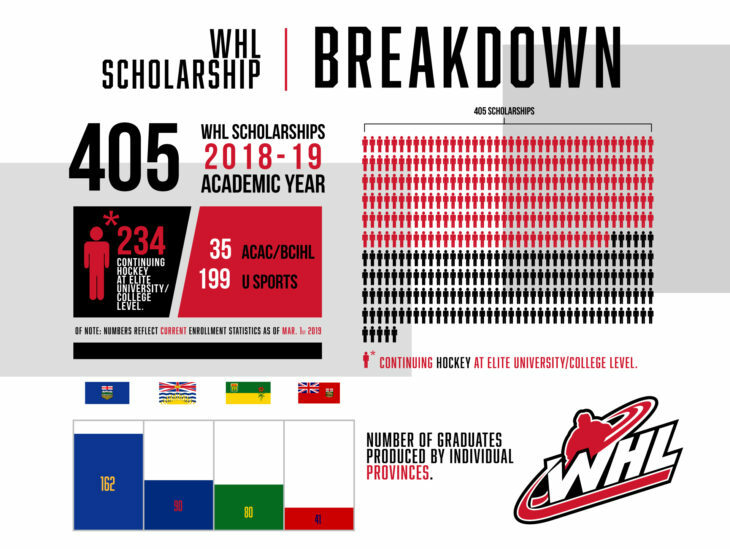 With 405 WHL Scholarships awarded for the 2018-19 academic year, this represents an increase in activations of 47.8 per cent over the past 10 years.